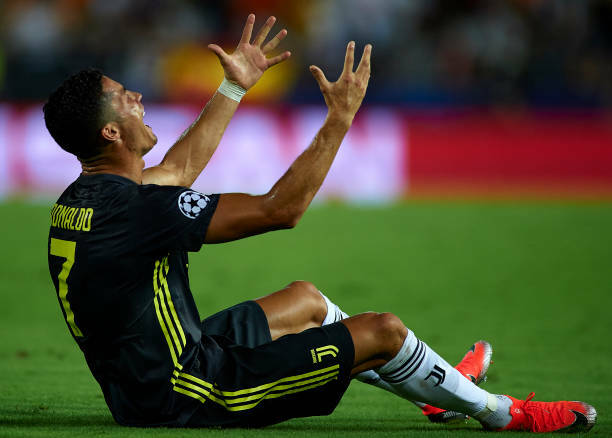 Cristiano Ronaldo might miss Juventus next Champions league game against his Former Premier league club Manchester United after being sent off for the first time in his Champions League career. The Portugal international player was making his first feature for Juventus in the Champions League but saw red in the 29th minute of the 2-0 win over Valencia for an off-the-ball incident in the penalty area and left the pitch in tears. The main thing is that Ronaldo's new team was placed in the same group as his former club Manchester United. He stands to miss Juventus next game at home to BSC Young Boys on October 2 but if UEFA increases the suspension, which is typical for an offence of violent conduct, he will have to sit out one or both of the matches againstUnited.